This narration explores the space of memory for Princess Diana, the shrine dedicated to her in Paris, France. This is the Princess Diana space of memory located in Paris near the Pont de l'Alma, just above the tunnel where she died from a car crash in 1997. Here, people coming to witness the site are mixing with our study abroad students, who are conducting research on the shrine. The Flame of Liberty (Flamme de la Liberté), a replica of the flame from the Statue of Liberty's torch in New York City, was dedicated here in 1987 as a symbol of French-American friendship (Bennhold, 2007). This space existed as a site of participatory memory since just hours after Princess Diana’s death, with her followers leaving messages and flowers in the space above the tunnel. Since that time, people have come to leave remembrances, write on the concrete walls of the bridge, and tape notes to the monument. Some have even campaigned to have a proper memorial in this space (Samuel, 2008). 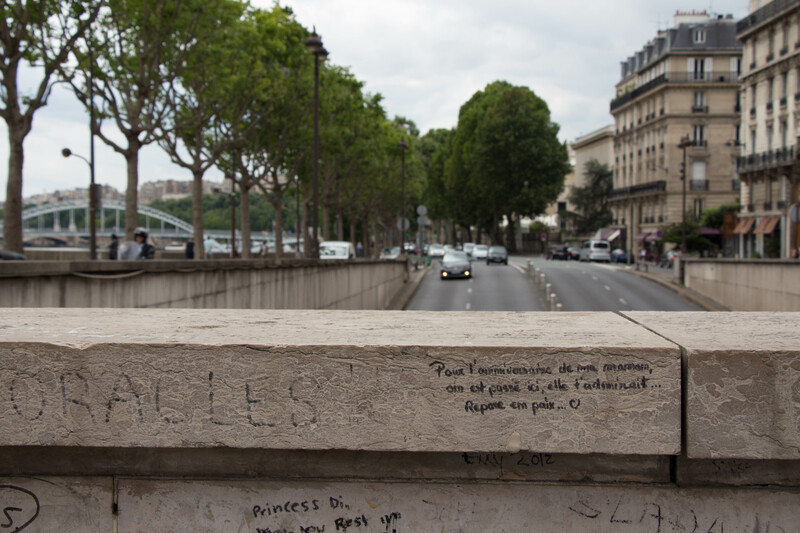 At the same time, the city of Paris attempts to erase this participation by repeatedly trying to clear off the writings left by fans and paint over the concrete walls. In 2013, the space was splashed with gray paint. 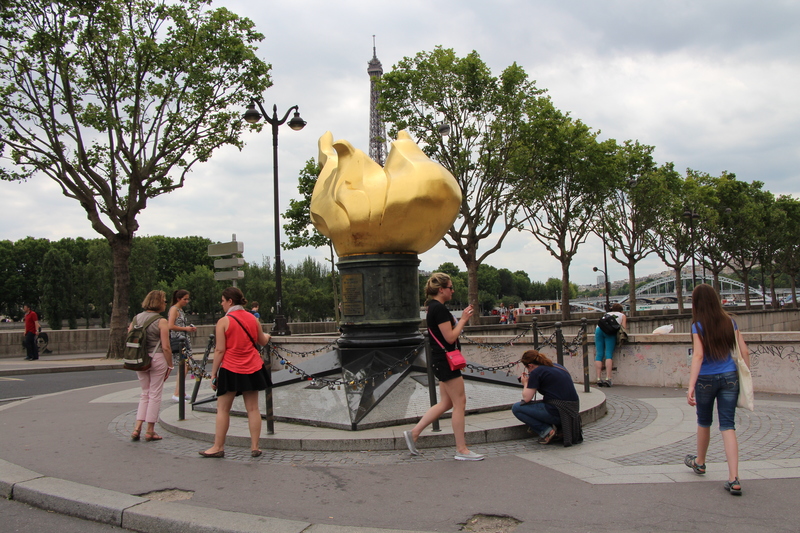 A Paris City Hall official stated, “The Flame of Liberty is not in fact an official tribute to Princess Diana so we are under no obligation to maintain it as such” (Allen, 2013). 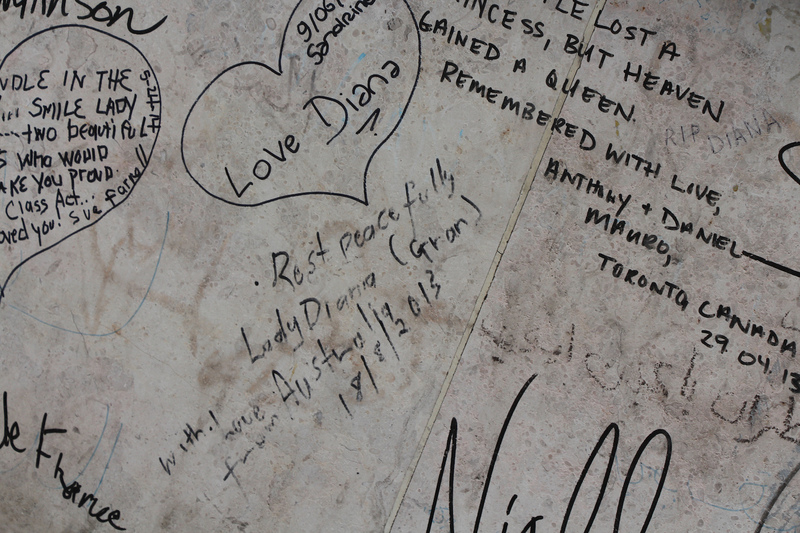 Without an official memorial in this space, fans of Princess Diana have given new meaning to this space in her honor. There are several websites that mention the space as a location for tourists to visit ("Princess Diana Memorial; Where is Princess Diana’s Memorial," 2016), and the Flame of Liberty’s Wikipedia page largely focuses on the memorial (Flame of Liberty). Throughout the year, visitors come to this site to leave messages or simply reflect on what they find here. On the anniversary of her death, fresh mementos were left here—often flowers and sometimes larger objects to mark the occasion. Not everyone knows what the memorial is for as there are no signs or indications from the government. The students that joined Liza on this trip were toddlers when Diana died. As such, she needed to give them background on Diana and the space. They discussed her legacy earlier on their trip when they were in London, and some of the students had parents and friends who were interested in Diana. This understanding helped them connect the space to their own experiences. As the time between her life and death grows, these kinds of memorials become “a species of pedagogy” that “seeks to instruct posterity about the past and, in doing so, necessarily reaches a decision about what is worth recovering” (Griswold, 1986). This instruction is important, as it helps to continue cultural memory and, in the case of participatory culture, allows for the expression of grief and loss in these spaces. By visiting this place, the students witnessed how the space allows for grief and loss, allowing them to understand this cultural memory. That said, government officials in Paris see the space as “dirty” and in need of a “cleanup,” going as far as putting up barriers to try to stop people from writing on this space (Silverman, 2002). People have written and rewritten across the concrete walls of this space, taped mementos, and even used the ubiquitous locks on the chain that surrounds the monument. In some instances, these locks evoke a tribute to Diana, while other locks acknowledge a love token between partners or friends—a part of a larger theme at memory sites across Paris. The addition of the locks link this site to other sites in Paris where locks were left as mementos and further aggravate Paris officials (Sheridan, 2015). This place marks a space of struggle over the agency of Diana's followers and the will of the Paris government. As memorial scholar Marita Sturken (1998) stated, “Public commemoration is a form of history-making, yet it can also be a contested form of remembrance in which cultural memories slide through and into each other, merging and then disengaging in a tangle of narratives." Participants who seek to share their memories of Diana, discuss class struggles, or simply leave a note behind will continue to share the narrative of this space with the thousands before them.